Kid Uno has been an artist since birth. Even coloring was a social, collaberative experience for her when she was little. “Want to color with me?” Supporting her growth in art is an ongoing learning experience for me. My creative interests lean more toward tie dye, construction, and sewing with salvaged fabric. Hers are more fine art–ballet, classical music, satin and silk, paper dolls, and stacks and stacks of drawings, paintings, collages….I feel a bit out of my element, but Charlotte Mason includes picture study and handicrafts, so that gives me a bit of a framework. And one benefit of homeschooling is that you can tailor a child’s education, so I decided to beef up the art department as much as possible for Kid Uno. I have freely questioned kind uncles and aunts who have far more expertise than I in art and music. They been very helpful in giving me ideas about what supplies to purchase and how to encourage her. And I read an awesome (for me) book last year called The Art of Teaching Art to Children, which I need to review. For someone with a great art background, it’s probably not too helpful, but for me it was great because the author covered several areas about which I am clueless (clay, printmaking…) and then broke it down step by step from planning to cleaning up. I was inspired to buy a Sculpey type clay, and then it sat in the cabinet for weeks, until we had free morning when all the stars and planets aligned. All four of the older kids (including my then two-year old) spent TWO solid hours at the table making clay tea sets! And now they play with them in their treehouse. My approach to art is two-pronged: creation and appreciation. They kind of go together. If you have some skill and exposure, you can create better, and if you understand the process of creating, you are more appreciative of other people’s art. So my goals for art education are providing the kids with materials that are enjoyable to work with and don’t frustrate them, providing them with time and space to create (and being generally tolerant of the mess), providing some opportunities to see art (whether Rembrandt at the National Gallery or fancy dresses at the mall or early pioneers’ handmade tools in a tiny rural museum), and providing them with basic skills in observing, drawing, photographing, sewing, sculpting, etc. Here’s how we do art appreciation: In Year 0, we use A Child’s Book of Art: Great Pictures – First Words. I have her (Kid Dos right now) look at a painting closely for a few minutes. Then I take away the book, and she describes what she remembers. This is so she can learn to observe closely, to remember, and to translate a visual into words. Then we talk about the painting. Some days I’ll ask questions such as: Where is the light coming from? What is the first thing you notice when you see this painting? What kind of brushstrokes did the painter use? What season is it? What shapes did the artist use? What mood is that person feeling? Do you like this painting? How is this art like that other art? What kind of paint is that? How much of the canvas did the artist fill? Then starting in Year 1, I pick three artists per year, buy a coffee table book of his/her art, and we spend twelve weeks on a single artist. Usually once a week, sometimes twice. Same process as Year 0. I think Ambleside Online has an ongoing list of artists each year. I just picked artist who I thought Kid Uno would like, I thought I would like, or we already owned a book. So that is picture study. I’d like to do more real-life art appreciation–when we lived in DC, we sometimes went to museums, but the kids were pretty young then. And the National Gallery of Art is the worst place I know of to take babies. Now that we are back in SLC, I’m slowly finding out about museums here, and cultural displays and things, but haven’t made much effort to actually get there 😦 Maybe this year. We have been to some ballets, though, and I think some concerts. So that’s something. Now for creating art. One priority when we moved into this house was to round up a good variety of quality supplies, keep them near the kitchen for easy clean up, and put some things low so the kids have access them without help (and other things high, so they have to ask permission for play doh and paints!). That has worked out well. I also have a half-baked plan of doing a special project with all the kids, maybe monthly (like the clay). That hasn’t been so smooth, mostly because I have to be in just the right frame of mind to spend an entire morning intentionally making a mess, and then the next three days cleaning up the remnants! But I have some things in the works–needle felting, more clay, paper mache, plaster of paris, tree branch weaving…In the meantime, they all use reams of paper (for drawing, coloring, and cutting), love play doh, frequently use watercolors, use a paint program on the computer, take photos of the floor and walls with our old camera, build things all over the house and yard…there is no shortage of handicrafts around here! Besides that, we use Drawing Textbook daily (one drawing per day), and I assign an art project every week or every other week. For Year 1, we used The Usborne Art Treasury which I was very impressed with. For Year 2, I got the Scott Foresman Art books starting in Grade 1. They seem pretty good, though maybe a bit heavy on the cut/paste/color type projects–less variety than the Usborne book. The Drawing Textbook is surprising good, IMO. Not at all flash, but it starts out with very basic elements of drawing and slowly works up to complex, multi-dimensional drawing (of objects). It fits well with the concept of short lessons, but it builds little by little. It has been interesting to see its effect on Kid Uno’s personal drawings–her perspective and scale have developed a great deal over the last year and a half. She’s getting close to the end; I’m going to look into some figure and costume drawing next, since she constantly draws beautiful ladies in fancy clothes. Besides that, the older two took a four week art class, and they love watching Youtube art instruction videos. They’ve both gotten some great art kits and supplies as gifts from friends and relatives. And they go through phases: paper dolls for several weeks, then a sewing project, then snowflake cutting, then weaving potholders, then whittling arrows. I’m looking forward to them getting older and more independent, since there is so much creative stuff they can do on their own! I will try to expose them to as much variety as possible, and then if they are super-interested in something (jewelry making, for instance) I will probably outsource at some point. And there’s always Youtube! 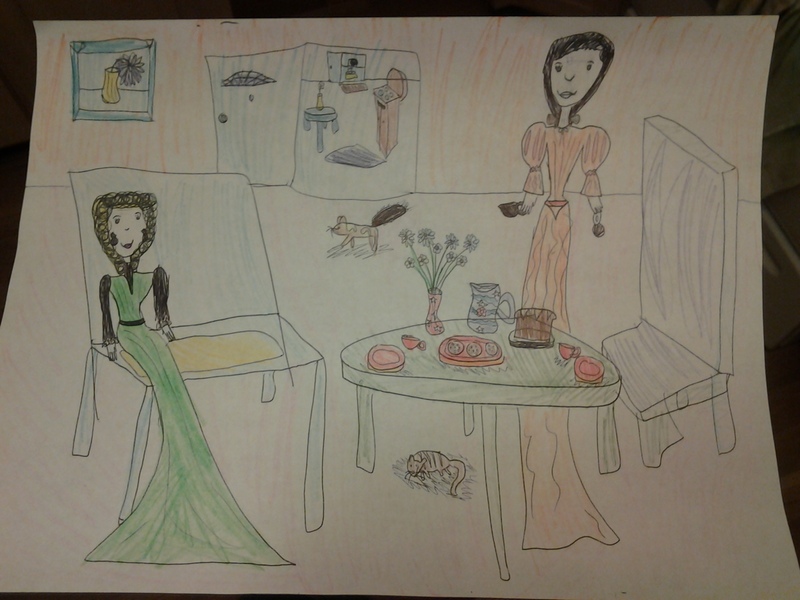 This entry was posted in Art Appreciation, Drawing, Handicrafts, Picture Study and tagged Ambleside Online, Art, Charlotte Mason, Year 0, Year 1 on February 9, 2015 by marisolstice. Good information! I will definitely be rereading this for tips and encouragement.